Join me here on my blog for the next 6 Fridays, where I plan to feature all the RITA nominated books in the Novel With Strong Romantic Elements category. I decided to start with a book I’d already read (no, that’s not cheating!) partly because I loved it so much and also because Sharla Lovelace‘s first book THE REASON IS YOU just came out in paperback this week. I read Sharla’s debut book and absolutely fell in love with her voice so I knew BEFORE AND EVER SINCE would be an automatic buy for me. Emily Lockwood has been sitting on a secret for so long, and buried so deep that she really doesn’t even think of it anymore. Why should she? She has a successful career, an ex-husband who rarely tests her patience, a mother who usually does, and a stubbornly independent grown daughter. Everything is fine, just another crazy kind of normal. Until Ben Landry comes back to town. From childhood friends to young lovers, Ben and Emily had an unbreakable bond. Or so she thought—until he disappeared for over twenty years without explanation. Seeing Ben again triggers more than mere memories and a tug at her heart. It rips the cover off an old secret that could hurt the people she loves most. 1. First off, you have to love that cover! I have a small confession to make. Sharla and I both write for Berkley and have the same editor, but regardless, I would have fallen in love with that cover no matter who had done it. It completely smacks of women’s fiction, yet is soft and romantic. A great foreshadowing for what is to come in the book. Plus, there’s something about the tease of only seeing part of a person on the cover. I like this woman. She’s confident and sassy. Just the kind of heroine I want to read about. 3. It’s a reunion story. And I love reunion romances, hence my obsession with Jane Austen’s PERSUASION. There’s something about taking a relationship that didn’t work in the past and fixing it in the present. 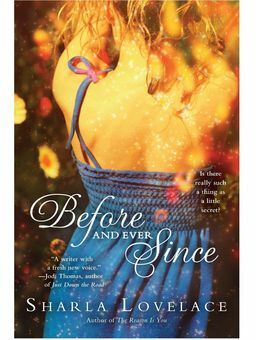 Who doesn’t look back on a former love and think “what would happen if we met today?” In BEFORE AND EVER SINCE, Sharla answers that question and gives the reader a bang up ending, sure to please. And I love happy endings! 4. There’s a mother and a daughter and a sister and an aunt all involved in the heroine’s journey. Female relationships are probably the most important relationships in our lives. Love how the story weaved them all together! 5. Lastly, Sharla Lovelace has an authentic voice. It’s what drew me in from the first sentence. Her stories are set in small town Texas, and you have no doubt that she knows what she’s talking about. Oh, No. No, no, no, no. Goose bumps ran the length of my body and back again. Ben Landry. As I stared into that face, I felt the old hurt I thought I’d forgotten seep through my bones right down through my feet, rooting me to the floor. But I was painfully aware that I had thrown on only a pair of jeans and a sweatshirt, and otherwise still looked like I’d just crawled out of bed. Additionally, after twenty-one years, I was looking at probably the only person on the planet that ever really knew me. And could turn my life upside down. “Yes, I am,” he said, his voice quiet. Love it! Terrific book. Hard competition in the RITA!